NAMM 2015: Tom Oberheim has put his name to some classic synths, but he claims that his favourite has always been the Two Voice. In fact, he loves it so much that he's brought it back. The Two Voice Pro is similar to the 1975 original, but comes with a few upgrades. We're hoping to find out more soon, but the great news is that the synth is shipping now priced at $3495. 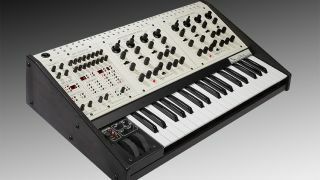 More on the Tom Oberheim website, but here are the all-important specs.